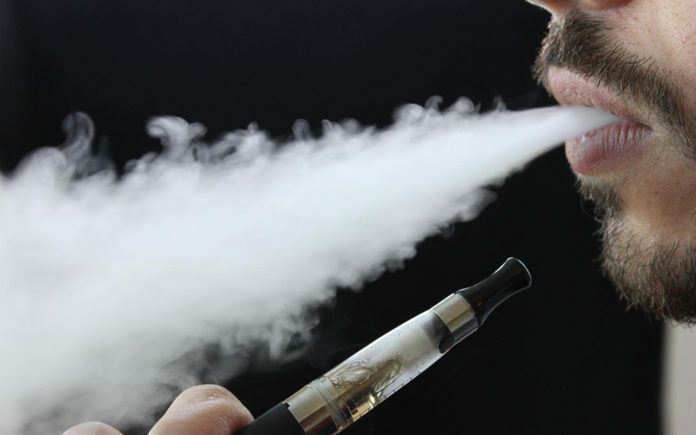 Are E-cigarettes effective in quitting smoking? We don’t really know at this point. There are several small studies that suggest electronic cigarettes are just as effective as the nicotine patch, but the majority of the studies show the opposite. A battery powered device that simulates smoking but without the use of tobacco. The E-cigarettes use a small heating element to vaporize a nicotine solution into an aerosol mist. The mist is then inhaled, thus providing the same satisfaction one would get from smoking an ordinary cigarette but without taking in the dangerous cancer causing tar from tobacco. If E-cigarettes don’t use tobacco, what is in them? E-cigs typically contain three main ingredients: nicotine, propylene glycol and some type of flavoring. Propylene glycol is a synthetic liquid added to foods, cosmetics and some medicines. It absorbs water and helps products stay moist. It can be found in things people eat, such as cakes, soft drinks and salad dressings. It can also be found in things we apply to our bodies such as in soaps, shampoos and deodorants. The flavoring available appears to be limitless, which has added to the appeal of electronic cigarettes. One can vape a cotton candy flavor and then try the bubblegum flavor the next time. National surveys indicate that e-cigarettes are the most widely used tobacco products among U.S. high school students, more than regular cigarettes. According to the CDC and a survey by Prevention’s National Health, about 40% of 18-24 year olds have never smoked regular cigarettes before using e-cigarettes. We don’t yet know if this population is starting early on nicotine dependence or will transition to regular cigarettes. At this point in time, we don’t really know. Since E-cigarettes are relatively new, there are no long term studies available revealing their hazards. What has been shown is that nicotine is highly addictive and can be harmful. We don’t know the long term effects of inhaling propylene glycol. Yes it is in foods that we eat, but many things can be safely eaten but can damage the lungs if inhaled. You can eat flour for example, but flour can cause lung damage when inhaled. If using E-cigarettes is a pathway to quitting cigarette smoking, like the nicotine patch or nicotine gum, then they may have benefit. But, the use of the nicotine patch or gum is not meant to be forever, so E-cigs probably shouldn’t be used for an extended period either. Until their effect on long term health has been studied more, I would be very cautious with them and wouldn’t recommend E-cigarettes unless it can help you quit smoking.